Special thanks to GMC for loaning us the GMC Terrain to enjoy over Memorial Day weekend. As always, opinions are my own. Can you feel it? It is officially Summer! For me, Summer kicks off at the start of the Memorial Day weekend. This year we decided to change things up and venture away from our beloved Ocean City, NJ by taking a road trip to Cape May Sunset Beach. Cape May Sunset Beach is a beach located near Cape May Point. It was rated #24 in the United States for its immaculate beach by Trip Advisor and is the only beach in New Jersey to earn this honor. 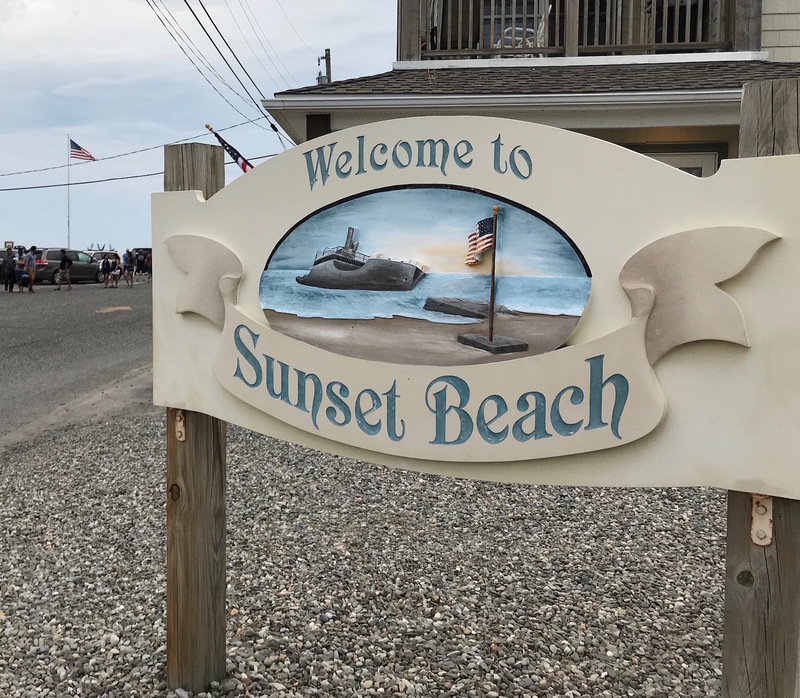 Sunset Beach is appealing to kids and adults alike and it is clearly evident why this is such a popular tourist attraction when visiting Cape May and the Jersey Shore. One of the most moving experiences at Sunset Beach is the flag lowering ceremony. A tradition at Sunset Beach for over 40 years, the ceremony takes place in the evening, daily at 7pm Memorial Day weekend through August, and at 6pm on Saturdays in September. Family members looking to honor their Veterans make reservations to have a flag lowered in their family’s honor. All of the flags flown at the mast at Sunset Beach are veterans’ casket flags that families bring with them. Veterans families participate in the flag lowering and memories of their loved one are shared over the public address system. Taps and Old Glory play in the background and everyone salutes the flag as it is lowered. It is such a moving experience and a wonderful celebration of being an American. I was proud that my children got to see the ceremony firsthand. Another huge draw for Sunset Beach is the S.S. Atlantus. For over 90 years, just off the shore of Sunset Beach, lies the concrete ship Atlantus. The S.S. Atlantus was a concrete ship that broke loose of her moorings during a storm on June 8th, 1926 and went aground. Today, the S.S. Atlantus is clearly visible from Sunset Beach and is a popular stop on Cape May’s Whale Watching Tours. Another must-do when visiting the Cape May Sunset Beach is to dig for Cape May Diamonds. Cape May Diamonds are pure quartz crystals and are found in a variety of sizes and colors. Cape May Diamonds are unique to this area and are in great abundance at Sunset Beach because of the strong tidal flow against the hulk of the sunken concrete ship “Atlantus.” Cape May Diamonds are known for their supernatural powers and are thought to bring success and good fortune so you know I had to pocket a few. Right before reaching Sunset Beach is the Fire Control Tower No. 23 (built in 1942). The Fire Control Tower No. 23 is New Jersey’s last remaining restorable World War II tower. We couldn’t help but stop and take a few pics of the GMC Terrain AWD SLT Diesel in front of the World War II tower. Who doesn’t love a real-life history lesson? I can’t recommend Cape May Sunset Beach enough. The next time you are in the Cape May area be sure to stop by and experience Sunset Beach. Cape May Sunset Beach is a wonderful way to spend the evening. Special thanks to GMC for loaning me the GMC Terrain so my family and I could enjoy our Memorial Day road trip.